Nevada District Court Judge Roger Hunt has denied WMC’s Motion for Preliminary Injunction against one of those defendants (a Motion that was actually unopposed by the defendant, but which the Court opted not to grant anyway given the merits of the case). See World Market Center Venture, LLC v. Michael Ritz, Case No. 2:08-cv-1747-RLH-PAL, 2009 U.S. Dist. LEXIS 30816 (D. Nev. February 4, 2009). 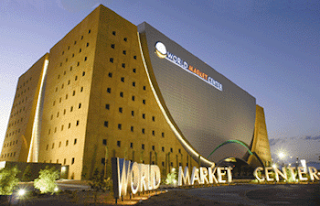 World Market Center Venture, LLC owns and operates the furniture trade show complex located in downtown Las Vegas known as the World Market Center. Among WMC’s portfolio of marks is (believe it or not) the federally registered mark LAS VEGAS MARKET (“Las Vegas” disclaimed). The mark was filed in September 2004, but WMC claimed first use going back to April 2001. Because of the highly descriptive (and with this decision, now decidedly generic) nature of just the word MARKET, WMC was only able to get the mark registered on the Principal Register under section 2(f) acquired distinctiveness. The allegedly cybersquatting domain name registered by Defendant Michael Ritz on or about May 2, 2002 (long before WMC filed is trademark registration applications), was marketlasvegas.com, which apparently provides links to Las Vegas hotels. The Court concludes that the words or phrase, "Las Vegas Market," are generic and purely descriptive in the most basic sense, and not subject to trademark or service mark protection. Neither party can preclude the other, or anyone else for that matter, from using these words or this phrase. The word "market" is purely generic. "Las Vegas" is descriptive of the location of the market. To permit a single party to claim ownership to such a phrase would be against the public interest and deny others their legitimate right to describe their business or activities. The remainder of the opinion is the Court going through the proper analysis of WMC’s case on the merits and why WMC cannot show a likelihood of success on the merits or the lack of any showing of irreparable harm if the injunction were not granted. It is inconceivable that anyone would confuse the domain name , which has links to Las Vegas hotels, with Plaintiff's trademarks, "Las Vegas Market" or "World Market Center Las Vegas," which showcases home and hospitality furnishings to wholesalers. There is evidence that Defendant's registration of his domain name and his use thereof preceded Plaintiff's efforts to register its name. It is also clear that Plaintiff only has an anticipation of using the name for ventures outside the scope of its present business. Furthermore, "marketlasvegas" is not confusingly similar to Plaintiff's distinctive WMCLV trademarks. There is no likelihood that its use will cause mark dilution. There is no evidence of bad faith on the part of Defendant. There is no likelihood of confusion. The marks are neither identical nor "extremely similar," although the domain names are merely reversed. No presumption of confusion arises in this instance. So for all of those other litigants with “las vegas” and “market” domain names – if you haven’t already given in to WMC’s demands to turn over your domain name (and probably pay some attorneys fees as well), perhaps the Court’s decision in this case will give you some encouragement to continue the fight.